How much does concrete raising cost? Concrete raising is typically about half the cost of replacing the same concrete. Ultimately, the cost of raising or stabilizing concrete is a direct reflection of how much leveling material the project will require. In general terms, concrete raising can cost between $2-$5 per square foot. For example: a 10 ft. x 10 ft. section, that needs to be raised, figures to 100 square feet. This job would cost somewhere between $200 and $500 to repair. How far the slab is settled, if there are voids present, or if other sections need to be involved in the repair, will determine where in that scale the job would cost. This is why we offer FREE estimates, so our experienced crew member can come to your home or business, and provide you with an accurate estimate for completing your specific project. What kind of material do you use to raise concrete? Polyurethane foam concrete raising material is injected as a liquid that sets-up as a rigid foam. This foam will NEVER loose density or shrink. This material is lighter than traditional mudjacking material, and requires less holes to install. Even better, the holes are smaller creating a virtually invisible repair! Mudjacking material is a sand based grout that will not lose its density. Combined with Portland cement this non-organic mixture is pumped under the slab of concrete. Different from organic material, RaiseRite’s slurry will not decompose or breakdown. Will there be heavy trucks on my lawn? The RaiseRite trucks remain parked on the street, while the concrete repair crew maneuvers the equipment to the site requiring repair. The hydraulic mudpump is roughly the size of a riding lawn mower. Armed with many lengths of hose, the mudjacking crew can reach just about anywhere. If you are using polyurethane to repair your concrete, a hose is ran straight from the truck/trailer to the repair site without driving a single piece of equipment on your lawn. How do you fill the holes? After the concrete is raised with mudjacking material, a foam plug is inserted into the hole, and the hole is patched over with cement. The concrete is ready for use immediately. However, it is recommended to allow the patch material to set-up before use, typically a couple of hours. Foam plugs help RaiseRite patch the holes, and act as a shock absorber, when slabs are affected by the frost cycle. Holes that are not patched with foam can pop out, when the material and earth under the slab expand from freezing. When concrete is raised with polyurethane foam (FoamJacking), these plugs are not used. The material used for raising the slab replaces the inserted foam plug as a shock absorber. Is there any maintenance needed? When our work is completed, it will be your responsibility to caulk the seams of the sections that were repaired, or backfill against any exposed areas to contain the material, and prevent future sinking. Self-leveling cement caulk can be purchased easily at a home improvement store and works great for sealing joints. Using a silicone based, self-leveling caulk, is recommended. If a crack is very large, to use less material, sand can be used first between the crack, before applying the caulk on top. Preventing water from going under the slab is key to preserving the repaired slab. Make sure that your downspouts are correctly placed, to assure water runs away from your concrete slabs or foundation. Taking these suggested steps for preserving your raised concrete is a condition of your RaiseRite warranty. What concrete can be raised? Solid slabs of concrete can be raise and stabilized. Gravel areas or blacktop are unable to be repaired, and need to be replaced or re-installed to remedy settling issues. Slabs of concrete that are badly cracked may also be too damaged to lift. 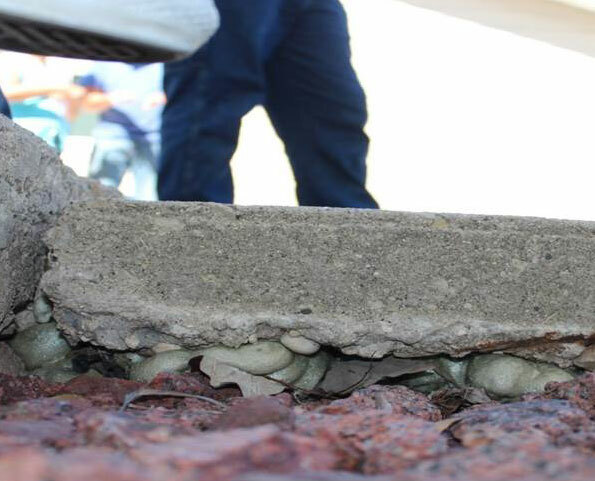 If you are not sure if your concrete can be raised, call us for a Free Estimate. Raising settled concrete can be half the cost of replacing it with less damage to your landscaping and downtime. Our expert estimators will be able to assess and provide you with an accurate, FREE estimate for your project. What is the difference between Mudjacking and Polyurethane Concrete Raising? Both methods of concrete lifting will achieve the same results. Mudjacking concrete leveling and polyurethane concrete raising will raise and support sunken or unstable concrete slabs by drilling holes and pumping material under the slab. Settled concrete is commonly a result of poor soil conditions beneath a slab. Polyurethane has become a popular repair method because the material is so lightweight compared to traditional mudjacking material, it will not further burden the already weak soil. Mudjacking uses a sand based material that is infused with Portland cement. This slurry is hydraulically pumped under the slab to fill voids and raise the concrete. Mudjacking material weighs on average 100 lbs per cubic foot. Polyurethane Concrete Raising uses a foam material that is injected under the slab. When the components of this material are mixed, a reaction causes the material to expand. This expanded foam fills any voids beneath the slab and raises concrete. This material will never lose density, is permanent and weighs only about 2 lbs. per cubic foot. After the slab has been raised, the only visible evidence that the concrete has been repaired are the holes. For this reason, polyurethane has gained HUGE popularity because of the nearly invisible 5/8″ holes that remain after the job is completed. Mudjacking involves drilling a series of 1″ holes in a slab of concrete, so the material can be pumped under the settled slab. Polyurethane concrete raising drills a nearly invisible 5/8″ hole and the process calls for considerably fewer holes than traditional mudjacking. 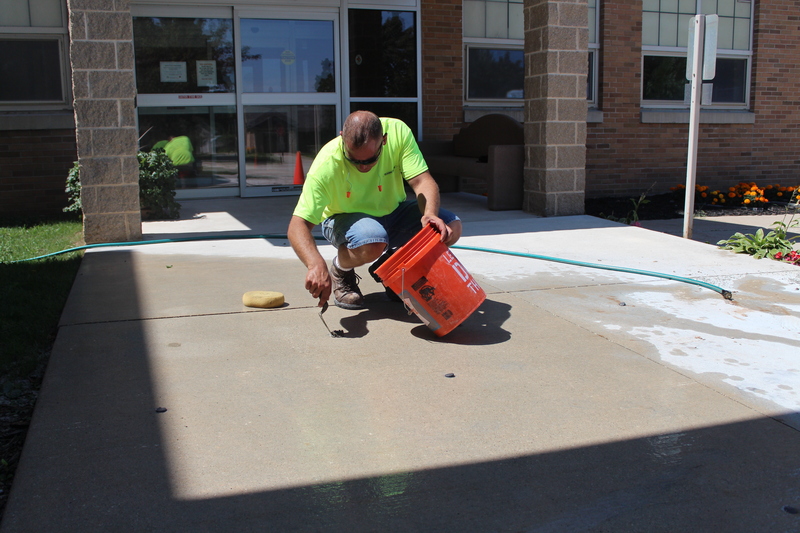 We have saved customers over $20 million, versus if they would have replaced their concrete. Concrete raising is typically half the cost of replacing your concrete slab. When large voids are present, this can increase the cost of the repair. While polyurethane material is more expensive than mudjacking material, the smaller hole size, lighter material weight, and fewer injection holes, make the investment in polyurethane over mudjacking well worth it. Do you have uneven concrete in your basement, drive or sidewalks? 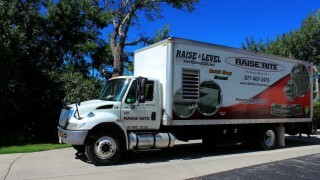 Interested in an estimate for our services? Get in touch or give us a call: 1-877-407-2473 Request Estimate Now!